Following a number of visits and inspections to Japan since 2010, the International Association of Golf Tour Operators (IAGTO) has announced that the first Japan Golf Tourism Convention (JGTC) will take place in October 2018. Peter Walton, IAGTO’s Chief Executive Officer, said Mie was the perfect destination at which to stage the inaugural JGTC. 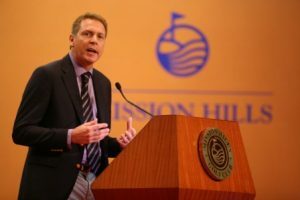 Walton, who met the Governor of Mie Prefecture during an inspection visit last year, said: “With golf’s second outing at the Olympics only three years away, it’s the perfect time for Japan to begin rolling out, carefully and cautiously, a national golf tourism strategy in which the JGTC and the Mie Prefecture will play a pivotal role. “Golf in Japan is extraordinary. There’s an incredible range of golf and travel experiences, from Hokkaido in the north to Miyazaki and Okinawa in the south and Kobe, Kyoto and Mie in the centre. “There are many courses right now in great touristic destinations that would like to have the opportunity to share their unique golf experience with international visitors, albeit carefully controlled and predominantly during weekdays. “Playing golf in Japan as a visitor is a privilege. One way the visitor is rewarded is by being treated as the most important person in that golf club on that day. “Very soon golfers from around the world will have the opportunity to be able to enjoy both the ancient and modern culture of Japan by taking a tour of the country via its fairways. “Making this vision a reality will not happen overnight and, of course, will require a lot of work, co-ordination and preparation. That begins right now with the announcement of the Japan Golf Tourism Convention. “Famously, Mie hosted the 42nd G7 Summit of World Leaders last year and now it will be hosting the first ever Golf Tourism Summit in Japan! A record number of 17 IAGTO member suppliers from Japan will be attending next month’s Asia Golf Tourism Convention in Danang, Vietnam.